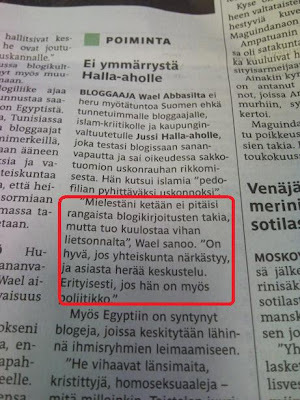 EGYPTIAN BLOGGER COMPLAINS OF EGYPTIAN STATE’S INFRINGEMENT ON FREE SPEECH BUT APPROVES OF FINLAND CRACKING DOWN ON FREE SPEECH MARTYR JUSSI HALLA-AHO……. – The Tundra Tabloids……. 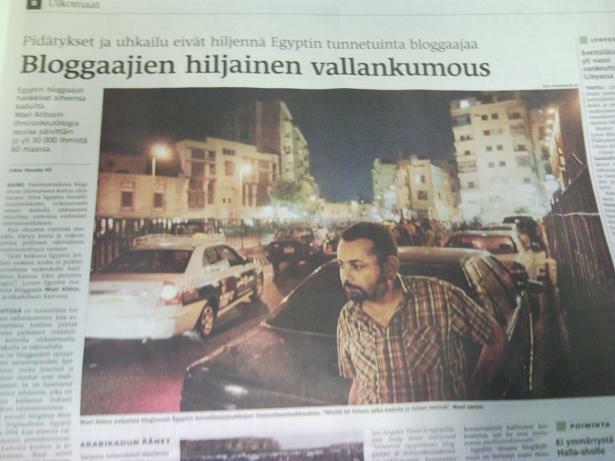 EGYPTIAN BLOGGER COMPLAINS OF EGYPTIAN STATE’S INFRINGEMENT ON FREE SPEECH BUT APPROVES OF FINLAND CRACKING DOWN ON FREE SPEECH MARTYR JUSSI HALLA-AHO……. Hey Wael, the next time the Tundra Tabloids hears of your being arrested by the Egyptian state for doing whatever they deem as an “insult to the state or to Islam”, don’t count on the TT to rush towards your defense, because your a fake, a coward and part of the problem. You are not one of those the rest of us can count on in time of trouble, no you’ll lead the charge to cheer the take down of a fellow blogger if you don’t agree with him or her, all the while you cry victim in your backwards state. So you see Wael, I’m holding you to the very same standards that I hold myself and the rest of blogosphere, which means no turning a blind eye to your outrageous double standards. There will be no cheering over your being hauled in to the local police station and locked up for “incitement” by the Egyptian state, something that the TT wishes never to happen, but neither will there be any mention of it on these pages. You just sunk yourself. Previous Post Previous Post NORWEGIAN PROFESSOR CALLS AFTENPOSTEN’S PERSONAL ATTACK ON JCPA’S GERSTENFELD EMBARRASSING……. Next Post Next Post SCOTTISH TRADE UNION INCITE CELTIC FOOTBALL FANS TO WAVE PALI FLAGS DURING MATCH WITH ISRAEL…….